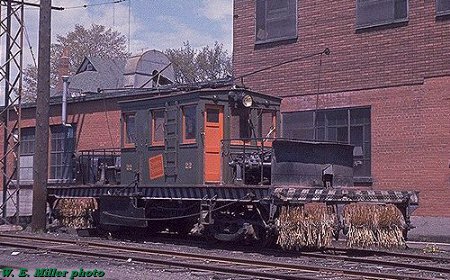 Sweeper 22 was built in the NS&T shops in 1920. Overall length was 44' 9" with a 30' 11" body. Rebuilt in 1946, it was transferred to the Oshawa Railway in April 1960 after the NS&T ceased electric operations. It was dismantled in 1965. The above view of 22 was taken in Oshawa on May 11, 1962.